Registration required and space is limited; please REGISTER today! Registration is open until February 28th, but hotel block will only be held through February 8th. You’re invited to participate in this free workshop. 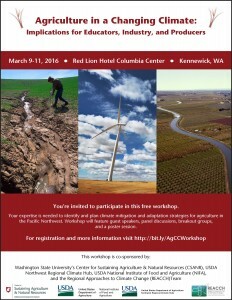 Your expertise is needed to assist in identifying and planning for climate mitigation and adaptation strategies for agriculture in the Pacific Northwest. 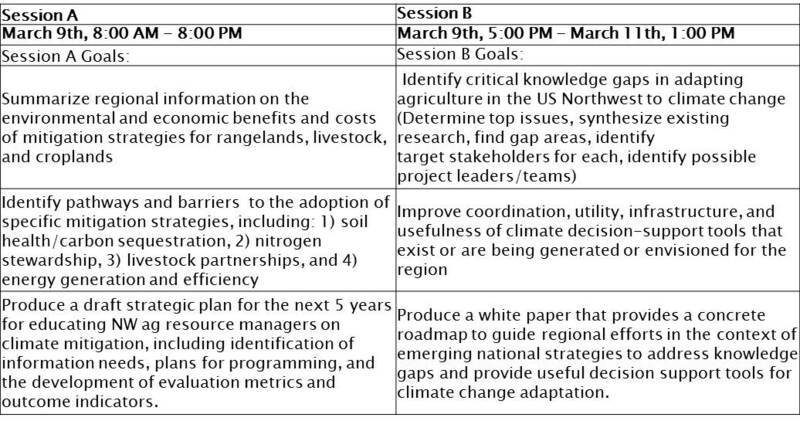 There will be dedicated mitigation and adaptation sessions, guest speakers, panel discussions, breakout sessions, and a poster session networking event. Help us circulate the event flyer: click to download. We have a block of rooms for conference attendees available for reservation from March 8th to March 11th at the government base rate of $94.00 per night. You must call and reserve your room by Feb. 8th or room availability cannot be guaranteed. Please follow these steps to reserve your room. Complete individual reservation with agent. Please help us spread the word by circulating the EVENT FLYER.